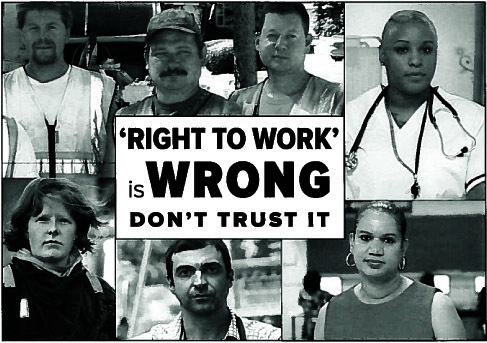 RIGHT TO WORK IS WRONG!! We knew Right to Work (for less) would come to Ohio. At this moment House Bill 53, the bill to “remove the requirements to join public employee union” is waiting for attention in the Ohio House’s Finance Committee. This amendment to the Revised Code would remove any requirement in the Public Employees Collective Bargaining Law that public employees join or pay dues or fees to any employee organization. It doesn’t specifically affect Local 880 yet. House Bill 53 addresses government or public workers only. A review of the 28 states that are currently Right to Work (for less) or open shop states shows legislative action often starts with public sector workers like state employees and teachers and then moves to the private sector. A Gallup Work and Education Poll* conducted August 3 – 7, 2016 confirmed that a majority of Americans continue to approve of Labor Unions. Gallup first asked Americans whether they approved or disapproved of labor unions in 1936. Since then, approval averaged 62%. Americans are most likely to say unions mostly help union workers themselves. We know that unions set the standard in an industry. They raise the bars for all workers. A majority of those polled say unions benefit the U.S. economy. Union approval reached its high points of 75% in 1953 and 1957 Gallup polls. Two legislators in Local 880’s region cosponsored House Bill 53: Kristina Roegner, district 37 (Summit) and Andy Thompson, district 95 (Carroll). Wait and see is not the option now. We must reach out to our state legislators and voice our disapproval. Just click the links below and let the sponsoring Ohio House legislators know what you think of their House Bill 53 and the Right to Work For Less. *A Gallup Poll is an assessment of public opinion by the questioning of a statistically representative sample, in this case Americans over 18. 2016 is the first poll since 2011 to assess unions’ effect on the U.S. economy, on unionized companies, and on union and nonunion workers.